No matter how you slice it, you're getting more than your money's worth. 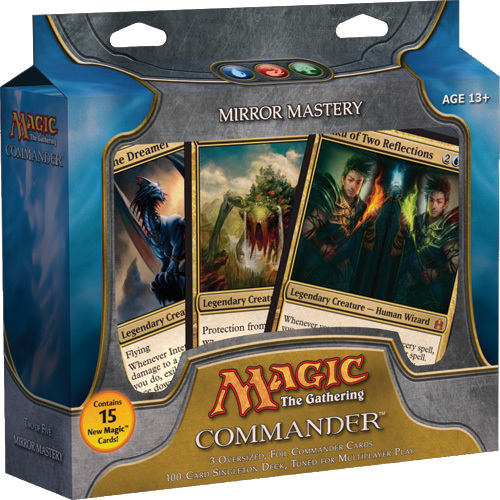 If you've never played the Commander format before then you'll want to buy this product as you're getting a great starting deck that you can immediately play out of the box. 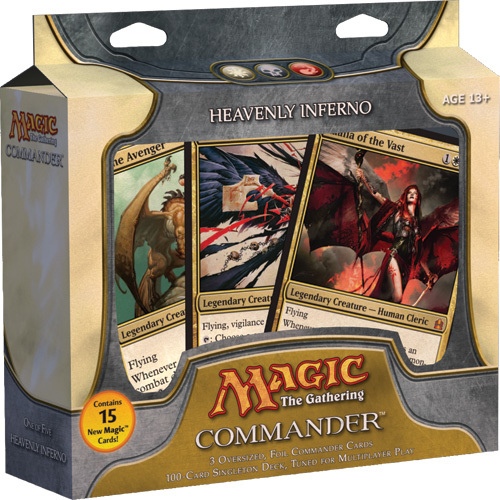 If you're a longtime fan of the Commander format then you'll also notice there are plenty of new cards that have never been printed before, new powerful Commanders, and reprints of notable cards that are considered staples of the format. Each deck comes with 100 regular-sized cards which includes the three Commanders you can choose from. 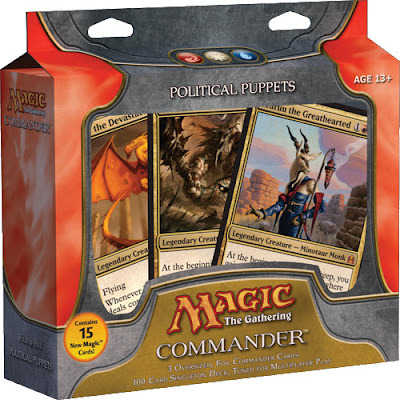 There are also three additional over-sized cards of each of those Commanders. Below is a description for each decklist just in case you aren't sure which deck suits your taste. Heavenly Inferno is all about casting ferocious Dragons, graceful Angels, and terrifying Demons. There's a plethora of creature destruction and mass removal to keep other creatures out of your hair while you set up your army of flying powerhouses. Kaalia of the Vast is able to summon these winged-beasts to the field to take down your opponents without even a need for a stretch break. Dragons, and Angels, and Demons! Oh my! Mirror Master includes ways to copy all of your best spells to have twice the amount of fun. 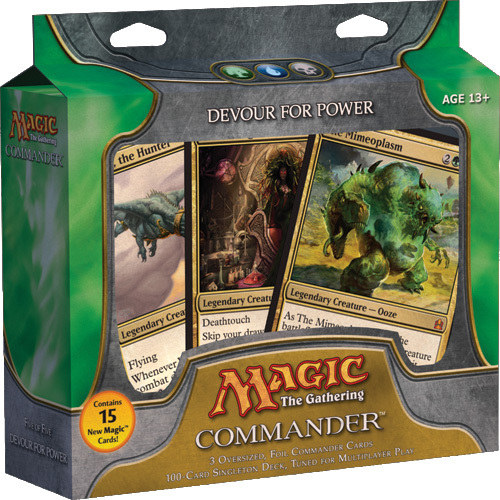 The main deck is composed of mana-ramping strategies to play massive beasts with many of those having the option to be evoked. Riku of Two Reflections prefers to copy (and paste) every creature and spell you cast since his philosophy is: one is the loneliest number that you'll ever do. 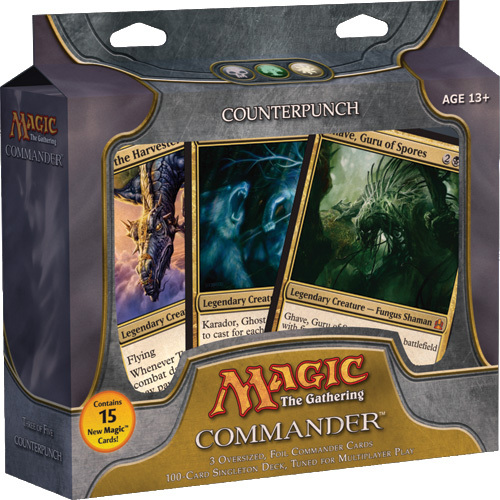 Counterpunch prefers a token swarm strategy to overwhelm your opponents. The rest of the deck focuses on defense, including deathtouch creatures with flying or reach, while you crank out more tokens. Ghave, Guru of Spores is a master manipulator of both tokens and counters since he can create tokens himself or sacrifice creatures to give counters to other creatures. He's also a fun-guy that will grow on you (it's a fungi joke that only Ghave can truly appreciate). Political Puppets lets you donate different permanents over to your opponents to further your goals and get on everyone's good side. There's plenty of defenders and defensive spells to make it pointless to attack you on top of the fact that everyone will love all the gifts you're sharing. Zedruu the Greathearted gives you additional cards and life every turn for the number of cards you've donated to other players which essentially makes her a gender-swapped minotaur version of Santa Claus. Devour for Power plays with not only your graveyard but the graveyards of other players. Whether by destroying creatures, forcing discard, milling all players, or whatever other means you deem necessary, you can fill graveyards to give you more options to utilize. The Mimeoplasm especially loves stealing the best qualities of different creatures and will grow into a behemoth of a weapon because of it. Graveyards are your buffet options and The Mimeoplasm and others get to omn nom nom anything you'll give them. This is Kylak signing out and realizing the easier decision is to just buy all five flavors of awesome.